Feeva bill themselves as "The Ultimate Cabaret Experience" and we couldn't agree more! This spectacular all singing, all dancing show will enhance any event that requires glamour, talent and that all important Wow factor. Feeva offer various options for your event, from a fully choreographed floor show to their own spectacular tribute show dedicated to the great eras of pop music - The Decades Show. They also perform a Divas show where you'll experience Kylie, Madonna, Girls Aloud, Beyonce and more. This is an experienced but fresh show and we're proud to offer Feeva to our clients, new and established. Feeva are a lively cabaret band available to hire in Glasgow and across Scotland today. Sorry, we don't have a setlist for Feeva yet Send us an enquiry and we'll get back to you, or check out the rest of the act profile. I would highly recommend Hire a band, the process was simple and you guys were more than approachable which made it very easy. The band we booked, Feeva, were amazing and I've had a lot of very good feedback and would 100% recommend to anyone. 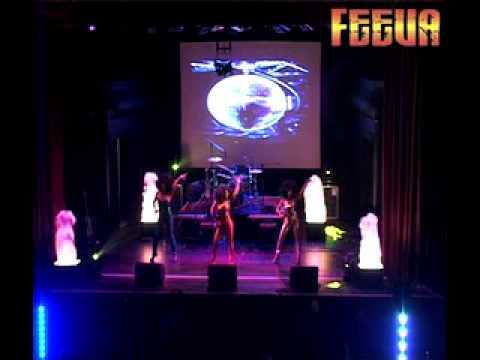 Feeva - fantastic would consider them for a full theatre show! Hi there, it's Stewart from Tesco, just to say how much I enjoyed Feeva at the Bonar Hall, Dundee last night, they certainly made the night special. Just a short email to say many thanks for performing at our Motown Ball at The Grand Central Station Hotel on Saturday. We have had excellent comments and feedback. Feeva were an absolutely fantastic group, The Holiday Inn staff booked them on our behalf when the entertainment we organised could not manage, they came at really short notice and put on a brilliant show.